A project manager who oversaw work on Drumm’s house has written a letter of support for the ex-Anglo chief. 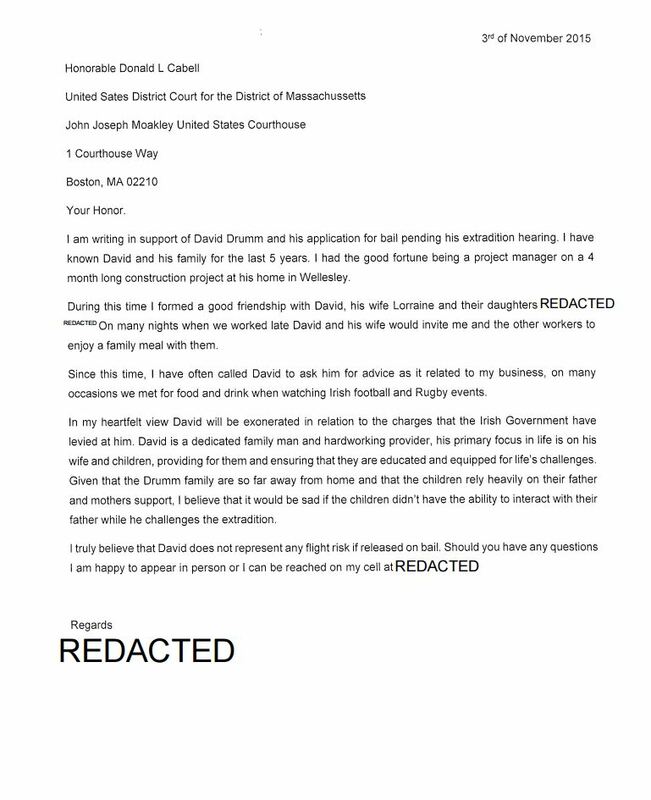 A LETTER WRITTEN in support of former Anglo CEO David Drumm ahead of his bail hearing in the US details how he and his wife Lorraine invited contractors working on his house in for meals during a project at the couple’s Boston home. Drumm, who has been living in the US since 2009, faces 33 charges if Ireland is successful in its extradition request. He is seeking to be released on bail pending his extradition hearing on the grounds that he is not a danger to the community or a flight risk. Letters from family members, friends, neighbours and business colleagues were submitted to Massachusetts District Court earlier this week. Since this time I have often called David to ask him for advice as it related to my business, on many occasions we met for food and drink when watching Irish football and Rugby events. Source: Can't read it clearly? “I truly believe David does not represent any flight risk if released on bail,” the writer concludes. In other documents submitted to the court, lawyers for Drumm argued that he and his family were active members of their community, even helping to prepare and distribute food baskets for the homeless each Thanksgiving and Christmas. His representatives, in their submission, said he never fled from Ireland despite being the subject of “relentless negative coverage in the Irish press over allegations relating to the worldwide financial crisis”. However last night the US Attorney’s office filed paperwork which described Drumm as “a clear flight risk”. Harman Burkat said his decision to move back to the US in the wake of the collapse of Anglo Irish Bank demonstrates that he previously fled Ireland. She claims “the Drumms had essentially fled Ireland under difficult circumstances to start a new life in the United States”. Last month, his lawyer Tracey Miner told Judge Cabell that she would need three to four months to prepare Drumm’s case against the extradition request. Email “Construction workers were invited into Drumm family home for meals, judge told”. Feedback on “Construction workers were invited into Drumm family home for meals, judge told”.